In addition, the development proposed an area of open space and environmental protection, a playground and stormwater management facilities. The Public Meeting ended at 10:50 p.m.
On Monday, February 12, Town Council will review an information report provided by Town Staff regarding details of the proposed application for Habourtown Village. Town Council will have the opportunity to receive the report for information purposes. No decision on the application will be made. A recommendation report will be presented to Council in the future. Will the proposed development plan include Waverly Beach Park? No. The proposed development plan does not include Waverly Beach Park. The plan includes lands that are adjacent to Waverly Beach Park. What will happen to the lands adjacent to Waverly Beach Park? The plan includes a proposal to create an area of public open space that is 2.84 hectares (or 7 acres) adjacent to Waverly Beach Park. The lands adjacent to Waverly Beach Park would be changed from private ownership to public; therefore, legalizing access to the existing trails and protecting 80 per cent of the old growth forest. The development plan includes a new public parking lot along Lakeshore Road. Which lands are currently public property and which are private property? The friendship trail is public property. The informal trails through the woodlot are located on private property. The developer intends to transfer the lands, where the majority of the trails have been formed, to a public agency to ensure the public can continue to enjoy them for years to come. What about the natural environment? What types of conditions will be considered for the 10-storey condo building? Birdsafe technology will be included in the architectural design to ensure the building meets Birdsafe best practices. These best practices include glazing or lighting, decorative architectural designs, creating visual markers, etc. The detailed design of the proposed building and its adherence to best practices will be reviewed by Town Staff prior to final approval. What about the historical heritage of the area? As part of the application, the developer submitted a Stage 1 and 2 Archaeological Assessment. During this assessment, areas were identified that required additional study. The results were submitted to the Ministry of Tourism and Sport (MTCS). A Stage 3 and 4 Archaeological Assessment has been ordered on the property and will be submitted to the Ministry of Culture once complete. The development cannot proceed until all of the archaeological work is complete and cleared by the MTCS. Can we just leave the land alone? Why do we need to add another subdivision? The lands are located within the urban boundary and are designated urban residential in the Town of Fort Erie Official Plan. In addition, the lands are designated as Greenfield according to the Growth Plan and the Niagara Region Official Plan. Greenfield lands are meant for residential growth within the region. Therefore, Provincial, Regional and Town Planning documents contemplate the use of this property for residential housing. The lands are in private ownership. 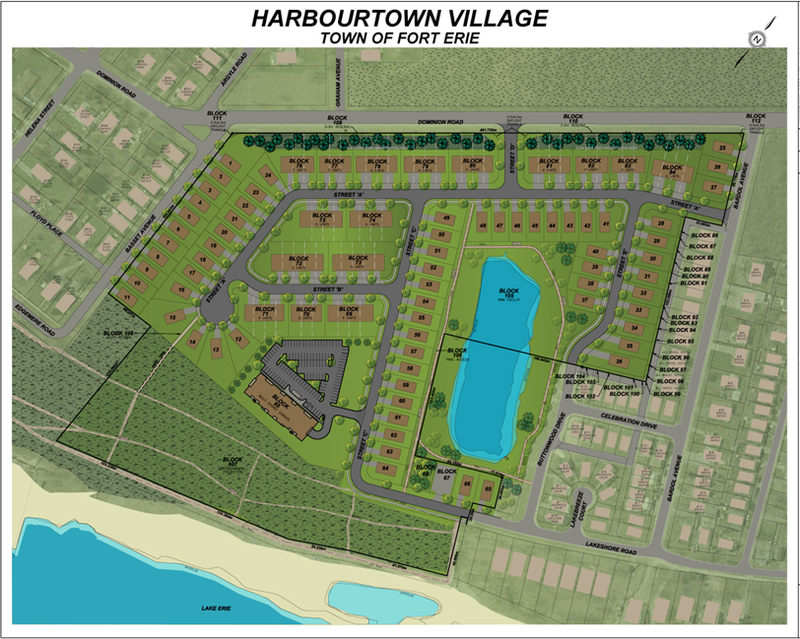 I support the development of the Harbourtown Village Proposal. The town would greatly benefit from more housing and definitely from condos. Finally…some housing in fort erie! Anyone who’s recently moved understands how few options there is for housing here. Especially rentals. All you can find are seasonal homes, rented out to tourists on a weekly basis, so the homeowner makes more of a profit. There are several new developments between Fort Erie and Ridgeway and unless I am wrong the homes in Harbourtown Village are not being built as rentals. That is correct. The application is for single-house dwellings, townhouses and a condo building. This is one of the few mature treed areas with public access to the water front. Even with the additional green space, the forested area will be greatly reduced and loose so much of it’s meditative appeal. In a perfect world, the town of Fort Erie would purchase this area and designate it a heritage area. It has historic and enviromental significance because it is on a migratory bird route, there are trees of significant importance, many wild animals will be displaced but also important to the residents of the area and tourist who frequent the are. There are lands available further west on Dominion Road that would be much more suitable and that would have less impact on the waterfront. One of the major objections to this development is the impact a 10 story building would have. It would be an eyesore on the horizon for anyone entering Fort Erie. There is no taller building in the area and certainly no other buildings of that size south of Dominion Road. Driving alson Garrison, even the hotel sticks up through the tree canopy but that building is in a more commercial area, not in the middle of and area of single family homes. This building would be placed right on the waterfront and in an area of one and two story single family dwellings. The shadow effect of the building will impact surrounding homes and the lights from this building will also impact wildlife and humans alike not to mention the impact on birds. The town does not have the infastructure to support a major increase to it’s population at this time. There are not enough medical facilities and the new proposed hospital will be at least 20 minutes away. There is already a doctor’s shortage and a threat to close the urgent Care hospital. There will also be a shortage of schools for families moving into the development and students will have to be bused to school. The new high school already has portable classrooms. There has been a traffic study done along Dominion road but has anyone looked at the impact of cars getting to Dominion Road? Many residents of this proposed development will be traveling along the QEW. Has there been an impact study done for traffic travelling south to Dominion Road or the impact the construction equipment will have on surrounding neighbourhoods during construction. Hi Lene – The wooded area is located on private property. The town doesn’t own it. However, the developer plans on making 80% of the wooded lands public for all to enjoy once the application goes through. With this specific plan, the reason the condo is set to be 10-storeys tall is for density reasons. The Region and Province dictates that any designated Greenfield site must accommodate 50 persons and jobs per hectre. This area is designated a Greenfield site. Hope this helps clarify some of your questions. If you would like additional information, you can contact the Senior Planner, Matt Kernahan, at mkernahan@forterie.ca or 905-871-1600, 2507. I may not live long enough to see improvement to our health care issues. Sort Erie cannot provide services to the citizens here now never mind the needs of the additional residents they are trying to attract. You are surely kidding- your arguments are old and boring- Fort Erie needs this influx of new construction and I for one would love to see a new development of this size- we WANT growth in this town- seems like it’s always the same argument against- let’s be FOR this!!!!! It’s good that we are keeping 80% of the natural land. 85-90% would be better but that’s not necessarily realistic and that the developer is being generous in allowing 80%. I am not happy about a 10 storey condo building. 5 storeys is more realistic for the area. Sticking a 10 storey building in among cottages and small 2 storey homes is like erecting a big middle finger – The biggest in Fort Erie since there are few, if any, 10 storey buildings in Fort Erie and no buildings even half as tall in that area. What plans does the Town have are to improve infrastructure to support the influx of these new families? A serious look is needed into the Medical facilities (including a shortage of doctors as well as rumours of closing urgent care in Fort Erie), school facilities (including the two new schools, amalgamated from several old schools that already require portable classrooms), and road construction (and the flow of traffic to and from the QEW for people going to work outside of Fort Erie). Hi Sue – With this specific plan, the reason the condo is set to be 10-storeys tall is for density reasons. The Region and Province dictates that any designated Greenfield site must accommodate 50 persons and jobs per hectre. This area is designated a Greenfield site. Regardless of the reason, a 10 storey building is an eyesore in that area. I’m not clear why the condo block needs to be 10 storeys high. I move here from Toronto’s Beach area, whose two 5-storey condo blocks on Boardwalk Drive (overlooking Lake Shore Blvd) are well worth you considering to emulate. All their parking spaces are underground, thus eliminating the need for the huge and ugly parking lot in this plan. Hi Nicholas – With this specific plan, the reason the condo is set to be 10-storeys tall is for density reasons. The Region and Province dictates that any designated Greenfield site must accommodate 50 persons and jobs per hectre. This area is designated a Greenfield site. Re Janine’s kind reply to my comment questioning the need for a 10 storey building: With great respect it appears that he high building and the proposed parking lot together occupy less that one hectare. So two or more 5 storey buildings (with parking spaces below ground) would fulfill the occupancy same criteria and be far less intrusive-looking. In full transparency, I am not a planner or engineer; however, these comments/feedback will be provided to our Senior Planner, Matt Kernahan, to share with Town Council and the Developer. If you have any additional comments, please feel free to contact Matt directly at mkernahan@forterie.ca or 905-871-1600, ext. 2507. Hope this helps! But Nicholas think of the fantastic view you would have with a 10 storey high rise- wow!!! Toronto is by no means a model with the exception of certain areas- ie Forest Hill, Bloor Village or Rosedale. This development could be a catalyst for future endeavors. I entirely agree with Dieter’s earlier comment that we need more people living in Fort Erie — if only to spread local government’s inevitable costs among more property owners, and so reduce our Property Taxes (I pay over double Toronto’s taxes for a property worth less than half my old Toronto home ! ). BUT Dieter I absolutely disagree that the tiny few who can afford a 10th floor penthouse view should be allowed to destroy the environmental enjoyment all other citizens. Ten floors towering above low-rise buildings and trees would be an obscene eyesore. But five floors & underground parking spread over the area of the proposed condo building and car park area would be an equal or even better catalyst of future endeavours. I own a home on Floyd Place. The reason I purchased it is because it is currently a quiet area, with beautiful woods and beach. If the project must move forward then perhaps a buffer between Basset Road and the development This may limit some of the congestion and preserve a larger piece of the natural setting and quality of life we all want. In other words no development on Basset Road itself. Hi Chuck – The application is still in the proposal stage. This feedback will be provided to our Senior Planner, Matt Kernahan. If you would like to contact Matt directly, you email him at mkernahan@forterie.ca or call 905-871-1600, ext. 2507. The Waverly woods Beach area is the only wooded park space along the waterfront area in all of Fort Erie’s east side. The proposed development which incredibly includes a 10 story apartment building which is completely out of character for the waterfront will destroy one of the few waterfront natural habitats for wildlife left in the area. Rare Fowlers toads, rare snakes, fox, deer and birds and insects such as butterflies etc. all use this area. After this is developed they will all be gone. People also use the area for nature walks and just a natural area to chill out in. Growth is of course necessary for any community but there are many far better places to place large condominiums in Fort Erie closer to shopping main intersections where abandoned motels stores etc. along Garrison rd. and other areas that could and should get this kind of development. Once this area is developed it will be permanently gone we don’t need another Bay Beach fiasco, please consider revising the zoning to remove the condos and to keep a wildlife corridor which keeps the pond connection with the remaining woods, the space where the condo would have gone to be left naturally wooded and cancel the extension of Lakeshore road to street c leaving it ending where it currently does and part 10 houses removed so woods to pond remain as is and a wildlife corridor to Dominion from the pond. Personally I would like the entire area to remain public park land and nature preserve but at least if this cannot be done the above should be considered as the remaining waterfronts need to be protected and once gone cannot be brought back and our children will ask why this was done. Hi Paul – The wooded area is located on private property. The town doesn’t own it. However, the developer plans on making 80% of the wooded lands public for all to enjoy once the application goes through. I understand that the property is in private hands, it apparently always has been, but there is no reason why this plan cannot be revised so the condo is not included and Lakeshore rd. extension is not put through, the archeology of the amusement park should be preserved, It is great that the developer has given 80% of the amusement park woods but how about removing the condo then 100% of the old growth woods and amusement park artifacts can be preserved and the developer still gets the rest? There is plenty of land available elsewhere for this condo. Hi Paul – With this specific plan, the reason the condo is included (and is 10-storeys tall) is for density reasons. The Region and Province dictates that any designated Greenfield site must accommodate 50 persons and jobs per hectre. This area is designated a Greenfield site. Are the density requirements for all of the developments in Fort Erie or just this particular proposed development? Density requirements are based on land designations set by the Town, Region and Province in order to meet future growth. These lands are designated Greenfields by the Region and Province; therefore, they have specific density requirements that must be met by the developer in order for their application to be approved. Hope this helps clarify. So again there is nothing written in stone requiring a 10 story condo on this particular development in this location. Hi Paul! I received obtained this response to your comment from our Director of Planning and Development, Rick Brady. You can contact Rick at rbrady@forterie.ca, if you have any more questions/concerns. “The Growth Plan has density requirements that need to be achieved. It does not need to be on each development but overall. When you have relatively large developments such as Harbourtown we should try to be well over the density requirements so that when we have small sites that cannot achieve the density we will average the density needed. If anything we should be increasing the density of Harbourtown to ensure the town meets this overall requirement. I agree there is no need to have both employment and residential on the same site. This site is predominantly residential with an allowance for small scale commercial in the first floor of the condo to service the neighbourhood and as well walkers on the friendship trail. min 2 per household ..474 persons…….min 2 cars per house … 474 cars…what is the update regarding the gilmore lodge project?…and yes…please leave the amusement relics as they are..have you been down lakeshore road?….what about emergency services…is there presently enough to sustain fort erie now….and where are they going to go?… and pretty soon a box store….our 3 grocery stores are already bulging at the seams…(there’s an idea…)…as are the one hospital and nursing homes….it’s not about the guy wanting to sell his land…it’s about density….apparently.. The Waverly Beach area is no place for a 10 storey condo! It does not fit with other Fort Erie development, nor does it enhance the lakefront. In addition, at the meeting the developers presented this plan as if it is ownership housing, NOT rental properties. If rental housing is needed in the area, this will not be the place to find it. Alternatively, if it IS intended to be rental housing, that should be declared up front, as there are different implications with transient vs. owner-occupied housing–the public and neighbors should have the correct information. Please provide! Hi Nancy – With this specific plan, the reason the condo is set to be 10-storeys tall is for density reasons. The Region and Province dictates that any designated Greenfield site must accommodate 50 persons and jobs per hectre. This area is designated a Greenfield site. The developer has stated that the condos will be for purchase and not rentals. Hope this helps clarify. Why does Fort Erie have to succumb to the density guidelines meant for the GTA? I support the development but the not the high rise. Common sense must prevail here. Fort Erie needs to plan and think locally. Not to be dictated to by the provincial government. I am sure there are exceptions made to the density guidelines, Fort Erie just has to try. I believe this proposed plan is completely inappropriate for Fort Erie. This is a high quality migratory songbird stop over location as well as being a significant historic site. The other danger is that this condo will open the door for high rises to be built along the lake shore. Do we really want this for Fort Erie? Have you seen what they did to Grimsby. Not my Fort Erie! It would appear that this greenfield site is too small to accommodate the density requirements without the blight of a ten story condo. I am opposed to this building in the woods near the shore. Too many people in an area too small will tax the environmental resources of the land. I believe the land designations of this site should be honoured as a conservation area and an area of significant importance to the areas flora and fauna. The destruction of up to 30% of the forest is unacceptable. There is a good possibility that once the bulldozers are done, the root systems of many more trees will be damaged and the hydrological cycle changed forever. The transferring, meaning the sale of land to a public agency is a good gesture if such an agency can be found and can afford it. There has been a tremendous amount of controversy surrounding how some agencies operate and considerable debate about the preserviation, conservation and restoration of natural heritage features, what that means and how that is achieved. In this case it is a mystery as no buyer has stepped forward to indicate interest. I have heard the Town’s name proposed as well as the NIagara Peninsula Conservation Authority. Who to trust with such an development is extremely worrisome. With the professional consultation and a long term management plan in place I would lean toward the Town and the Waterfront Strategy. Condos are the future.. i buy for sure! I am not a resident of Fort Erie however I do live in Niagara and I know that we are on the cusp of a change throughout Niagara that will define this area for generations to come. Mississauga was at a similar crossroads about 40 years ago and they decided that developments were needed above all else. I have a friend who works there now who says he would never live there because of the type of city it has become. Compounding the difficulty of the decision you have to make in Fort Erie is the fact that you can not rely on any inputs you receive from the Conservation Authority. I guess it all comes down to the legacy we wish to leave our children. A Niagara that is green and filled with natural spaces or a Niagara that is concrete grey and congested. Is the main trail in the woods that starts by the memorial bench by the recently built houses going away, or will it still exist? The ten story condo does now belong there at the meeting even mayor Redicop suggested that the condo be moved back closer to the Dominion which would be much better for traffic flow also I understand our fire department is not equipped to handle over 8 stories . The mayor also proposed and wall or fence between the condo and the woods which makes sense if it goes through . Also the planner keeps saying that we need apt building in Fort Erie which we do and he kept trying to slide it under the carpet at the 2 meetings that this was a condo and not rental and probably not too many people from town will be able to afford them. Fort Erie had never been good at holding on to our historic buildings or precious areas as is the Waverly Beach Woods. I have news for you Lesley- even Toronto Fire does not have Aerials that will reach 10 storeys- how do I know? From personal experience- 40 to be exact so this is not a valid argument. Firefighting is done by interior attack. But let’s be PRO development. If someone was on their balcony on the 10th floor, waiting to be rescued during a fire……do we, in Fort Erie have the equipment to reach them? Yes, we are able to reach the 10th floor of a building with our equipment. I concur with others here on the 10 story high rise. At least flip it 180 degrees and put it on Dominion Road side of the development. As a taxpayer of Ft. Erie, I strongly object to the loss of habitat and quiet space in the proposed project. Even if the developer did not cut a single tree, the increase in the number of people and all that entails will completely change the character of the entire community, people, vegetation and wildlife. The town missed a great opportunity when they decided to NOT purchase the area in question when they had the chance. It is obvious that this proposed project will NOT be an income producer for the town because Ft. Erie will have to hire more people, buy more equipment, and generally spend more on infrastructure and infrastructure support. I would like to see an economic analysis which takes into account the REAL costs of said project, and also uses proper methods to value the area as it is NOW. There are ways of doing this. Any proposed industry coming to the area to employ all the people that have already, and could be in the near future moving to town? Not at this time; however, the town is currently taking steps through its Industrial Land Strategy to encourage future opportunities. The 10 storey condo doesn’t make sense in this development and while i have read the reasons why you say it has to be here can you not just look at the rest of Fort Erie and see why we have no condos on the waterfront? They don’t fit in. Fort Erie has a beautiful waterfront hidden down laneways and in green spaces and this condo development will be an eyesore. Have you seen how many people use this green space along the historic Erie Beach shoreline? Considered the biking trail? As the owner of Lakeshore Bed and Breakfast on Lakeshore Road I’m sure the town doesn’t know that 50% of our guests arrive on bicycles. This development will increase car traffic on Lakeshore and will make it increasingly more dangerous for our cyclists who love coming to stay with us. Many have said it already but I will reiterate that the condo should be built where the town needs development. Jarvis Street or Garrison. We have lived in Fort Erie 7 years. I also live in Toronto during the week and I have to say that there are properties that have been vacant and decaying in Fort Erie for the entire time I’ve lived here. Why don’t we get the Speedway going and create some jobs and development where it belongs-along the QEW in Fort Erie and not on the wooded historic waterfront where we have migratory birds, biking and walking trails and public greenspace. I’m astounded that the Town would consider this subdivision considering the state of the roads near this development. Dominion is a mess. One of the worst roads in Ontario last year. Helena will need to be 4 lanes to accommodate traffic from this subdivision. I understand the town wants the additional tax revenue because frankly the taxes are very high in this town because of a small industrial base, but a 10 storey condo in a cottage/beachfront area? Very misguided. Given this development I’m considering selling our home. We moved here for peace and quiet away from Toronto and traffic and now I will have it in my front yard. Very unfortunate and Fort Erie would lose a New Business of the Year, Community in Bloom award winner and the #1 place to stay in Fort Erie on Trip Advisor. Perhaps the many residents who oppose this development have it right and the Town is looking at the tax base instead of considering how ugly a 10 storey condo will look and the impact it will have on the natural habitat. Very well stated. I have had several business people tell me that the condo in that area will be bad for business. Fort Erie may need more housing but it does not need this subdivision at this location. What we need are houses , maybe half the price (or more) and half the size (space usage) than what is being built. Some apartment blocks 4-5 stories high set in naturalized greenery. Housing that is affordable to middle and low income earners. The Summary and Conclusions for Housing in Niagara Region supports housing to meet those needs. Fort Erie does not need to become Toronto’s next subdivision. Perhaps those who enjoy condo living would be better suited in Toronto. We all would like to enjoy a view of the lake. There is no amount of mitigation or planning that will replace what will be destroyed. Birds and wildlife will be driven out by the construction and loss of the habitat that sustains them. Water treatment and some trees are little compensation for the disruption of the naturally set ecosystem. Happy to hear that further archological assessment is planned. I am curious as to how much of the subdivision land will actually be investigated. From the potential to hold 1812 War dead to increased knowledge of the earliest Aboriginal presence, it is long overdue. War dead should always be treated with respect. Some uncertainty though comes with studies and assessments being conducted under the oversee of the stakeholders. It is not necessary to build on all the land within the urban boundary. The development plans in the Niagara Region need some serious adjustment to accommodate people’s actual needs. What may be deemed appropriate for Toronto may not be so here. Will there be enough land for food production or for clean air vegetation? 80% of ” old growth” trees are in the 20% protected area. Experience has taught me to wonder just how much damage will the protected area sustain during construction. And the long term effects of having the subdivision adjacent to it. In follow up to my last message, l wish to note that the comment ,” perhaps those who enjoy condo living would be better suited in Toronto”. was meant in sincerity not in sarcasm. Have a nice day. Fort Erie has a good chance to grow, but in a way that will make it thrive. It should look at Toronto to see what NOT to do. We moved from Toronto because the traffic , condo building etc. Calm yourself- sounds from reading your response you seem to say that while you live in Toronto during the week and enjoy all that comes with that but you stay here on weekends. How nice. I too am from Toronto- in fact commuted to and from work there. I know the beautiful biking system in Toronto especially the lakefront with all those high rise condos right there. It is spectacular while at the same time bringing people downtown. This development here is needed for a variety of reasons. To build elsewhere will not attract buyers- even cause the same objections- AGAIN. I walk that trail everyday with my dog and don’t believe that this will destroy anything- including your business. The sky is not falling- there are other businesses here in town that need and would invite the extra income. You sound a bit self-serving. Has anyone walked along the waterfront in Waverly Beach trail area lately,? What is normally a scenic space surrounded by nature, is now an assault to the eyes with “Private Property No Trespassing” signs literally every 20 steps! What’s so disconcerting is to see the signs in the areas immediately on the waterfront itself. I’ve read the posts, and I totally agree with those who want to preserve the natural beauty and peaceful space that can never be replaced, if we make the error of thinking that developing this sanctuary is in the best interest of the community. I totally disagree with those who are pro development for this particular area. I don’t have my head in the sand when I state unequivocally that over developing a waterfront area that is a destination area for nature lovers and home to cottagers, is not progress. I don’t buy the density requirements as others, including the Town, have posted. And, if this is to be, place the condo building(s) along Dominion. If we do have a shortage of properties available, then they will certainly sell. You’ll keep your density requirement and continue to offer residents and visitors a place to walk and bike surrounded by nature. If 80% of the forested area is to be preserved, who will be responsible to make sure it will never be developed? Is there a nature conservancy group or a public agency that the private owner can turn the designated waterfront and forested to?